Please note we have recently changed our uniform supplier; the benefit of this is improved quality and the ability to order online. To order online simple click onto http://www.border-embroideries.co.uk and click on the fuchsia box entitled ‘Schools Online Ordering’. Then simply chose our school and begin ordering. Please note you will have to register the first time you use this site. Delivery of uniform to school is free of charge. Full details of how to order school uniform can be obtained from the school office. *skirts should be of a suitable length namely just above the knee or knee length. Watches & Stud (plain) Earrings Only. Earrings will need to be removed or covered during P.E. Children need to ensure that they consistently bring their PE Kits to school on the days they have PE. Option 1 - White t-shirt with short sleeves; Black Shorts or Skort (or tracksuit bottoms when outside). 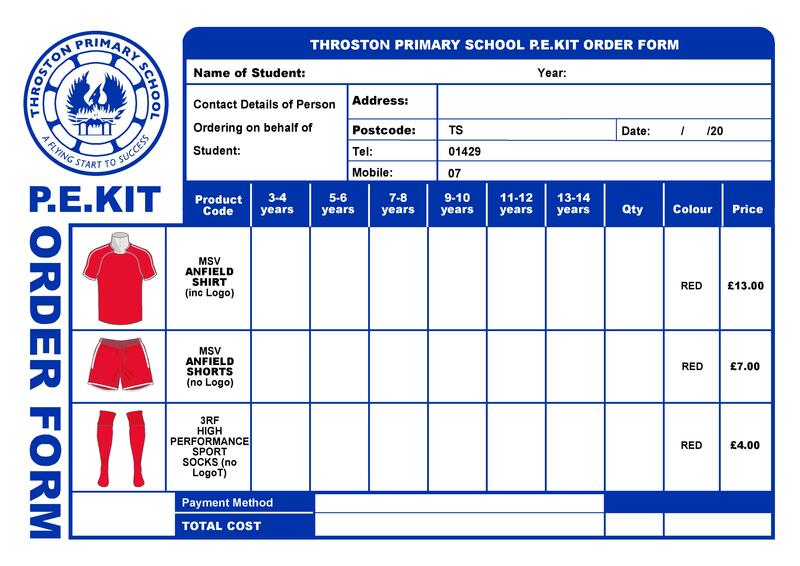 Option 2 - Red t-shirt, shorts and socks (we have this kit in school, and it can be ordered via the form below). Gym shoes or trainers (due to health and safety children will not be allowed to perform PE in their bare feet); No jewellery. Towel, Swimming Cap (available from the school office priced £1.50). Boys need to take trunks, baggy shorts are not permitted, and girls need a One Piece Swimming Costume. No Goggles (unless a letter is given to the class teacher proving their child’s eyes are affected by the chemicals in the pool; all goggles must carry the C.E. mark). No Jewellery.